You may all be wondering where I have been these days. Some of you might be downright frustrated that there haven’t been some good recipes. Perhaps you think I’m on hiatus because of the frrrrrreeezing temperatures (no! of course not, ice cream lovers eat frozen treats regardless of temperature and season) and others may think that I ran out of recipes (nonsense! there are truly an unlimited number of ice cream concoctions). That’s right. The Husband and I gave birth to a beautiful and sweet baby boy in December, and as many of you can imagine, there is no time for ice cream making right now. Baby Sugar is so excited to eat ice cream as soon as he is old enough. But for the time being, he’ll stick to another type of milk product! Keep on reading our flavor archives and try your hand at some of these delicious treats. 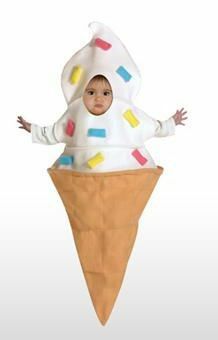 Baby Sugar in soft serve! I love the costume. Cone should be dipped in chocolate and sprinkles though. Looking forward to future posts.